Introducing the final GR of the set and a new forerunner. 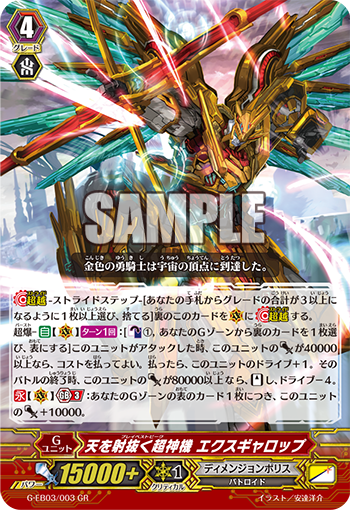 Burst AUTO (VC) 1/Turn [Counter Blast 1 and Choose a face down card from your G zone and turn it face up] When this unit attacks, if this unit’s Power is 40000 or greater, you may pay the cost. If you do, this unit gets drive+1. At the end of that battle, if this unit’s Power is 80000 or greater, Stand this unit, and it gets drive-4. AUTO (VC) Generation Break 3 This unit gets Power+10000 for every face up card in your G zone. 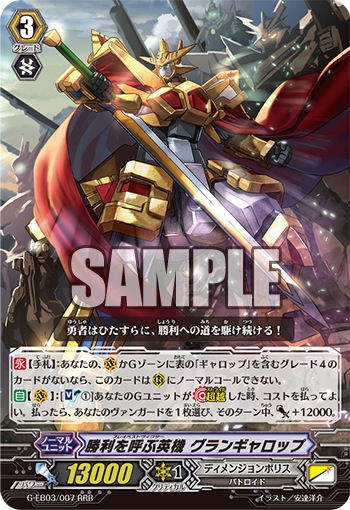 ACT (RC) [Counter Blast 1 and put this unit into your soul] Draw a card, choose one of your vanguards, and it gets Power+4000 until the end of the turn.